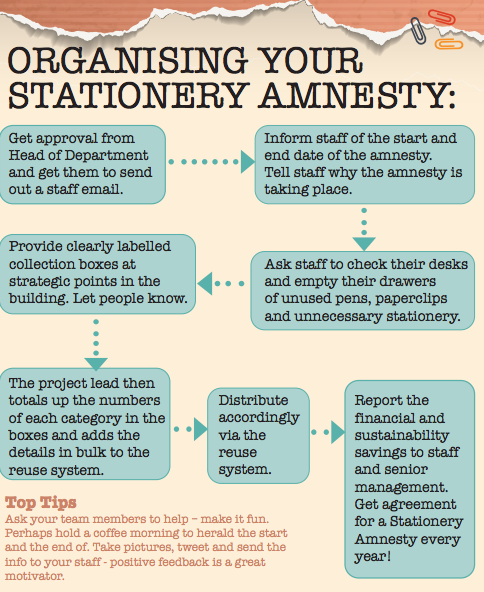 Welcome to Warp It’s really quick and easy guide on how to deliver a Stationery Amnesty in your organisation. They can be fun- if partnered with a coffee or cake morning! We’re going to go through what a Stationery Amnesty is, highlight why it’s important and discuss some of the issues that might not have occurred to you at the first glance. We will talk about how we are going to approach this activity and how you can deliver it with minimal fuss and maximum impact. We are going to progress through a 10 point plan, before analysing and showing you the free resources that are available for you to download. What is a Stationery Amnesty? Think about this: everyone in your organisation has a couple of staplers in their drawers. Staplers cost £3-£4 ( $2-8 each), meaning there is a significant value in all of those low value, high volume assets. Think about how many staff you have: 1K? 5K? 10K? Then think about all those staplers. And then think if they all have 3 staplers each they will also have 3 rulers each! You’ve probably got many thousands of surplus stationery items items like in your organisation....but your colleagues are still buying stationery! I was at a client's office the other day ( I won;t say who) and was talking about stationery amnesties- and the guy opened his drawer and counter seven- yes seven- pairs of scissors!! Top tip before you start: Find out how much your department or organisation spends on stationery. This all adds up to quite a lot of surplus assets that are out there and they can be worth a fair bit of money. 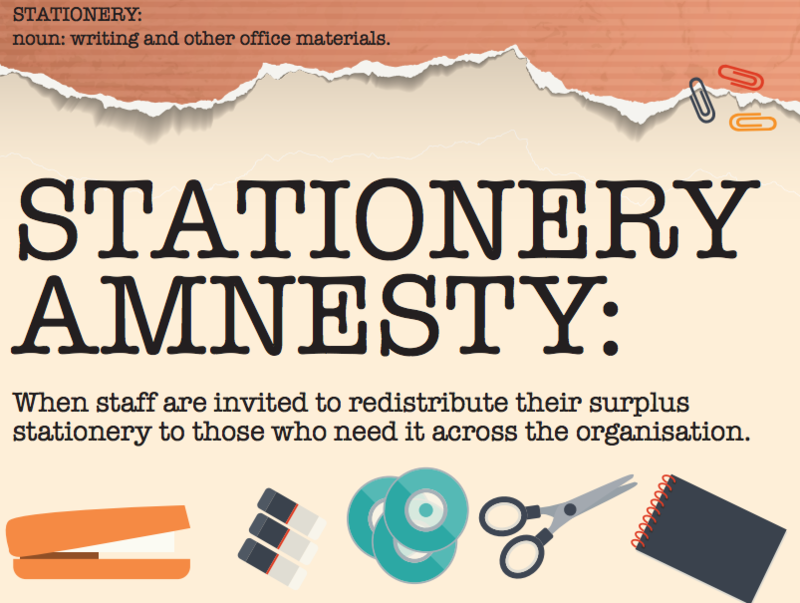 In a Stationery Amnesty, we invite staff to empty and declutter their drawers, declutter their cupboards and bring all that surplus stationery to one point and then redistribute it. This is all about improving office stationery purchasing procedures and stationery ordering and control. Taking control of the stationery cupboard! Why is a Stationery Amnesty important? Well, they are designed to save money and reduce environmental impacts. You naturally reduce the procurement of unnecessary stationery, since have collected and then redistributed to those who were going to buy new . Also, a Stationery Amnesty is going to act as a keystone habit. 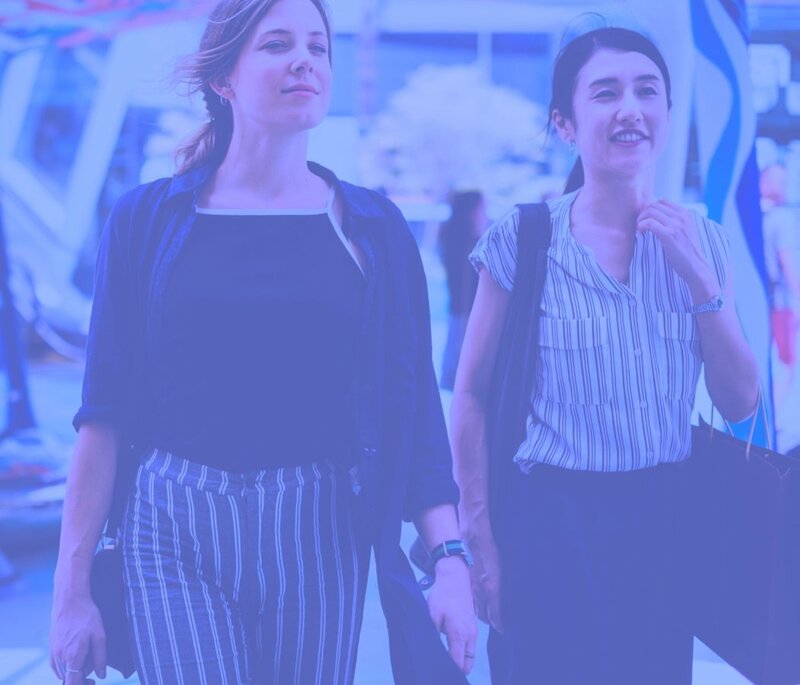 A keystone habit is one of those habits or activities that your staff can embrace, which then in turn affect other working areas of their lives. So, with our focus being the reuse of surplus assets, the Stationery Amnesty can be the first step towards doing a more developed, more complex redistribution of surplus assets across the estate. Here is a little story about how keystone habits can change an organisation. The Approach- create a buzz!! We like to roll stationery amnesties out incrementally, so usually, we do an office or a building at a time. The benefit of that is, when you do one property or one building, you deliver them one by one and you learn what works best as you go. When you go to the next one you can implement those learnings. So it’s ‘test, proof, deliver’, ‘test, proof, deliver’, and repeat. Now another good aspect of this approach, the incremental roll out, is that you can actually create a demand, or buzz for the Stationery Amnesty. You create a waiting list of the departments or building that is going to get the project. People go crazy when access is limited. This incremental roll out creates demand, because you know that people can’t wait for them to come as you develop a waiting list. Once there’s a waiting list it’s just like any restaurant - if you walk down the street and you see a restaurant full of people with a little queue outside it, then you see a restaurant that’s empty and with no queue, you know you can’t go to the one without the queue! So, create a demand for you amnesty. Then, monitor the impact from a savings point of view. When you’ve got that evidence, you’re going to illustrate the benefit to others, and then you start to repeat that process. Remember that the Stationery Amnesty is a Keystone Habit and so at the end. you’re either looking to develop bigger reuse projects or more sustainability activities. As you roll the project out across the organisation- you will be learning as you go an iterating the project. Keep a note of how you deliver the project as you will want to hand it over to someone else after the first 4 or 5. In a perfect world each department should have respinsibility for their own amnesty which they run every year or two. 10 steps to reuse nirvana with low time input and maximum impact. You’ve got to be prepared for that, for the naysayers, and have a plan if things go wrong. So, you’re going to need to develop some logic behind your argument for a Stationery Amnesty. Think about our opening paragraph. Nobody can argue with that. Align this project with an existing strategy. So, if you’ve got a sustainability strategy, resource use strategy or procurement strategy, align the Stationery Amnesty with that. This brings senior management on board and it shows that you are not going to deviate from the path. Now, like any project, you need to develop a plan. It need to be clear who’s going to deliver what, by what time and what the actual milestones are. You can download the plan in the article. Keep a track of the plan as it changes over time. You will want to develop this project so that the departments can start to run their own. The idea here is to get a momentum going but hand it over to each department to run their own in time. One of the benefits of breaking down the milestones is that you can set deadlines, and ideally you want to be setting very short deadlines. If you set a deadline in the future, nothing is going to happen until two or three days before that deadline. Just set short deadlines or small milestones; that way you’ll feel like you’re winning, so you get many wins with each project. One of the most important things you will want to do is develop your pilot Stationery Amnesty, the first physical event. Start by picking one office, one building or one floor, wherever works best. It’s probably best to start in your department or the department that you have most contacts and networks in. You need to pull a team together in the department that is most involved with stationery. This team should most likely contain the stationery procurer, the person who monitors the stationery cupboard, and some interested stakeholders. Certainly someone from procurement, someone from sustainability, maybe someone from waste management, and maybe someone from logistics or facilities management. If you get most of these people, you’re on the right path. Seven - Make it fun! At the end of this article you're going to be invited to download some great materials for communications and marketing the Stationery Amnesty. You are going to have: banners, pull up banners, wall banners, posters, and email signatures . You’re getting to the staff and you’re telling them exactly what’s going to happen. You’re telling them exactly what’s going to be expected of them, and some people don’t like being told. So make it fun, get on Twitter or Yammer, create your own hashtag, do a photo competition, do a coffee morning where everyone is bringing their stationery, all that sort of thing. So, just think creatively and make it fun. If you create a good memory for them, they’re more likely to want to do it again and give their support. Eight- How to collect the Surplus? You need to collect in all that surplus stuff. 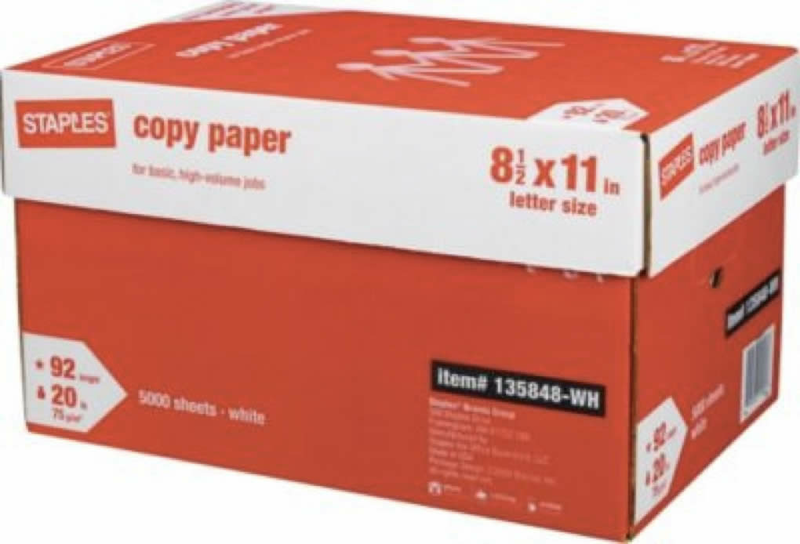 The humble photocopying-paper box is your friend - the lid and the box actually. What you do is you stash a few boxes and put a label on each one, one saying stapler, one saying pens, one saying calculators, one saying Lever Arch files etc. You will get your staff to come to a central point to drop off their stuff in these different labelled boxes. Now, these boxes can follow you around your estate during your amnesties and are a great examples of reuse. Obviously, if you want to go further- get a plastic box. If you’re going to do a Stationery Amnesty or roll out a Stationery Amnesty over a couple of years then get yourself a plastic box, which you can even have branded for marketing purposes. 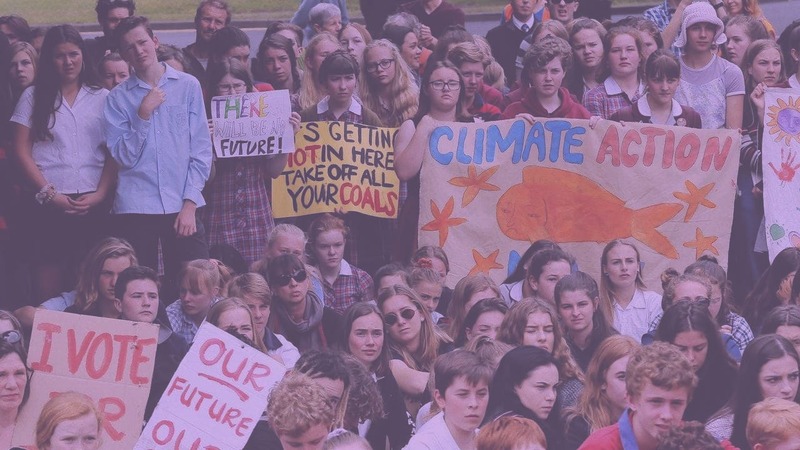 The next thing to do is to total all of those assets and put them into your reuse system, in order to redistribute them to the rest of the organisation. Your reuse system might simply be an email ring that you’re using, it might be a message board, or you might have an online platform like Warp It. Next step, You’re going to track those savings. On our system, we track them automatically, but you might have to work it out on a spreadsheet if you are running a more ad hoc system. 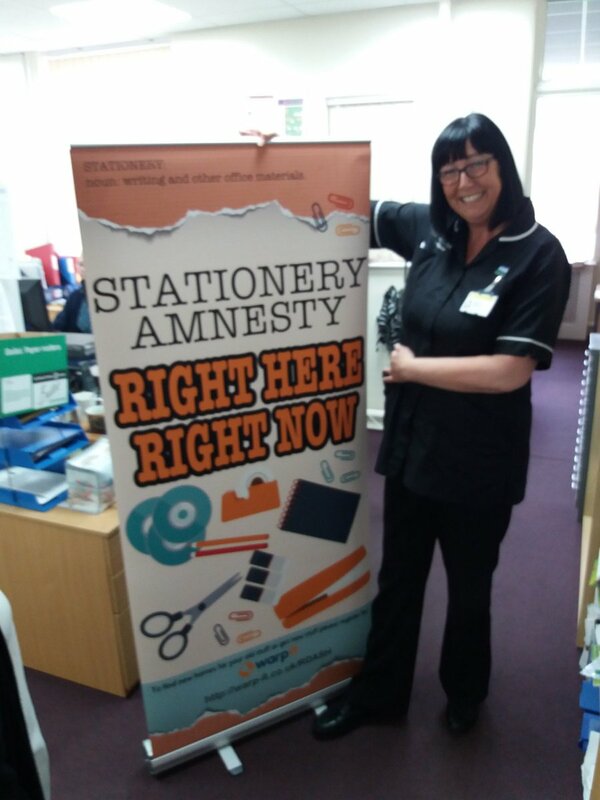 About one to two weeks after you’ve delivered your Stationery Amnesty, total up the values that you’ve saved, put them in a spreadsheet and then use that evidence to develop a business case for getting more resources to be put into the Stationery Amnesty. 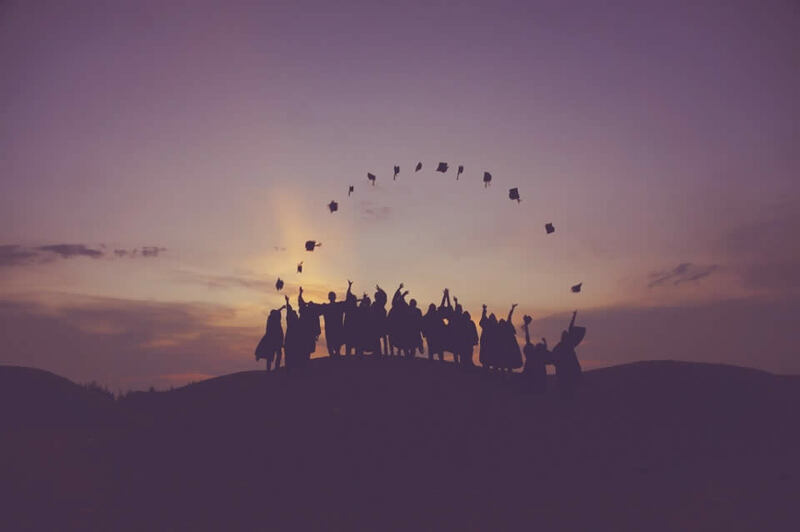 Make the point that it is worth repeating across the organisation. .
After you’ve done ten to twenty Stationery Amnesties, you’re going to have a really significant value there and you can use that evidence to strengthen policies and change behavior around reuse. You will have already demonstrated to the senior management and staff how reuse can work and how much money can be saved. You need to be telling everybody about those savings, especially after the pilot, and then again after other projects. Tell everybody about it, do a newsletter and get the savings figures out there! Tell everybody about your crazy target and start right at the beginning. For example, ‘we want to divert X amount of waste’ or ‘we want to hit this many buildings’. Remember, my top tip is, you can create a demand for the Stationery Amnesty by using scarcity as a tactic. You can do this by only letting a few buildings join the initiative in turn. You want to be releasing the project building by building. Create a waiting list. Where there’s a waiting list you know demand will be triggered and you will be able to create demand from scarcity. This comes from a fear of missing out (FOMO) . Bonus! Eleven - Build on the momentum, what next? When you’ve done your series of Stationery Amnesties and you’ve got all that evidence. You have got the departments running their own amnesties. Now use it to develop that reuse campaign. You might want to do a Declutter Campaign. Have you got any top tips? PLease add them in the comments below.